SUMMERSIDE, P.E.I. – Brandon Bruce, Mark Reners and Tyson McCallum all scored in the first seven minutes as the Brooks Bandits clinched first place in the preliminary round at the 2013 RBC Cup with a 5-2 win over the Surrey Eagles on Thursday afternoon. The victory means the Bandits will face the Minnesota Wilderness in a Saturday semifinal, while the Eagles will face the Summerside Western Capitals in a rematch of the 1997 national championship game. Semifinal times will be decided following Thursday’s preliminary round finale between Summerside and Truro. 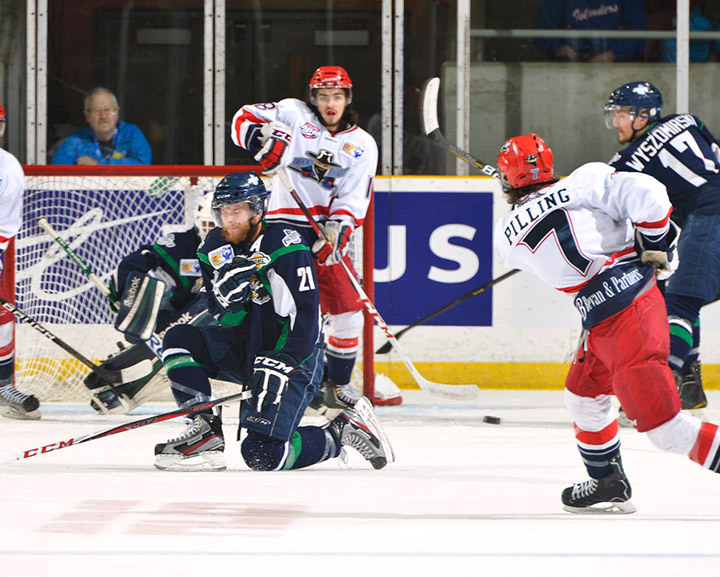 Anthony Petruzzelli and Cam Maclise had the other goals for Brooks (3-1), which gained a measure of revenge for its 4-1 loss to the Eagles in the Western Canada Cup championship game on May 4. The Bandits spread around the scoring – five different players scored goals and 12 had points. Not one Brooks skater put his name on the scoresheet more than once. Dan O’Keefe and Trevor Cameron scored for Surrey (3-1) which trailed 5-0 before the game’s midway point and suffered its first loss of the preliminary round, and just its second ever in three trips to Canada’s National Junior A Championship. Brooks hit the scoreboard first 84 seconds in, as Bruce buried a loose puck behind Surrey netminder Michael Santaguida, ending Santaguida’s shutout streak at just over 91 minutes, dating back to the Eagles’ overtime win over Summerside on Monday night. Reners made it 2-0 at 5:37, finishing off a pretty feed from Dakota Mason, and McCallum, making his tournament debut, snapped one past Santaguida 1:15 later, giving Brooks a lead it would not relinquish. Petruzzelli pushed the lead to 4-0 just past the five-minute mark of the second period, picking off an ill-advised Surrey pass and beating Santaguida, and Maclise scored his tournament-leading fifth goal at 7:43, collecting the rebound of an Anthony Paskaruk shot and making it 5-0. The Eagles finally got on the board nine minutes in to the second period, as O’Keefe drove the net to tip a centering feed from Drew Best past Brooks goaltender Michael Fredrick, cutting the Bandits lead to 5-1. Cameron scored arguably the best goal of the tournament thus far to round out the scoring at 15:04 of the middle frame, picking up the puck at his own blue-line before dancing around a Brooks defenceman and Fredrick for a shorthanded marker. Surrey got no closer, managing just six shots in the third period as it lost for the fifth time in 26 playoff games. Despite the shaky start Santaguida finished with 31 saves, while Fredrick made 22 stops to record the win. Arena/Aréna CUP Location/Lieu Summerside, P.E.I.